Today, Abbe went through another examination of his kidneys. Or maybe that should be his kidney. 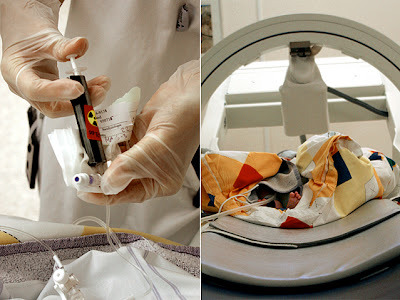 They inserted a radioactive substance in his blood which went through his kidneys. He was given a sedative, to make him lie still in a gamma camera, which registered the radiation. The camera shot a frame a second or so, during around 20 minutes and the end result was a little blurred film which reminded me of the ones you see taken by thermal imaging cameras. The aim of the examination is to show how kidneys take up the drug, and that it runs off as it should. And you could see quite clearly from Abbe’s little film that there was only one kidney, on one side. Apart from that, all was fine, as far as I understood. I guess we’ll see once the doctors give us their verdict. I must admit it felt a bit weird when they brought along a syringe with one of those radioactive symbols which reminded me of my old Kraftwerk records, and injected it into Abbe’s bloodstream. But apparently, the dose was weaker than what you normally get during an ordinary X-ray or CT scan.